One of the benefits of having my own forum here is that I get to help promote projects that I think are cool. I try not to do that TOO much because you'd get sick of that pretty quickly, and wouldn't bother reading at all. So I try to reserve plugs for the really best stuff. David Gallaher and Steve Ellis have just launched a Kickstarter campaign to help publish a book called The Only Living Boy. It's about... well, I'll let the two of them explain... You can't see it, but there's an iframe here of their video. You can link over here to see it. Gallaher and Ellis have proven to me many times over that they know how to tell a good story. Not only are their both pretty talented, but they put a lot of thought into the story flow and presentation. They really know how comics work, and how to best utilize the medium to tell their stories. 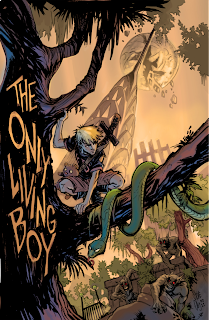 They make a fantastic creative team, and I don't doubt for a second that The Only Living Boy will be every bit as good as High Moon, Deadlands: The Devil's Six Gun or any of their other collaborations. They've got some nice pledge packages available to boot! I put my pledge in as soon as I heard about it and I see several comic professionals have already lent their support too. Jimmy Palmiotti, Jamal Igle, and Kevin Colden to name just a few. So, if you can, take a look at their Kickstarter page and see if it doesn't look like a project you'd like to help support. Cut Me Some Slack! It's Friday! Andy Capp Joining Alcoholics Anonymous? A Harsh Reality for Newspapers... & Comics?